The newest member of our little bird family arrived on Tuesday. 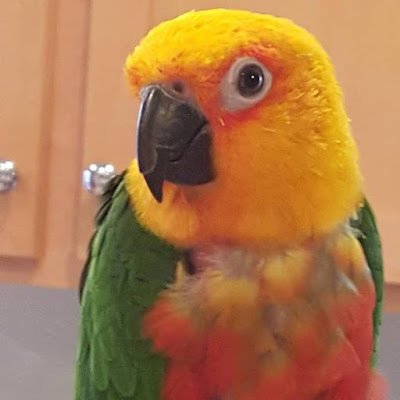 I saw her shivering in a huge cage at my local pet store and told one of the people who works there, "That bird is shivering. Can you do anything to help it? Put one of those little bird sleepy-things in there?" She said, "No, honey, we can't do that, but I'll see what I can do." She started looking around the cage and talking to the bird, and I knew she was good people, even though she called me "honey." When she looked at the top of the cage, she said, talking to the bird again, "Oh, no, someone has unplugged your heat lamp." So she found a step-stool and climbed up and plugged it in. Then she opened the door of the cage and talked to the bird some more. Not in that too-high voice or baby talk like some people (including me sometimes, I admit it!) use with pets, but just nice things to say to a bird. She said to me, "Look at this poor thing. He's been plucking." That's when I saw the bird had plucked out a lot of feathers around its neck and from its chest. She said, "He's a rescue. He needs a real home. This store isn't good for him." 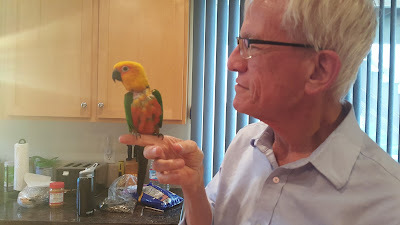 Turns out he had belonged to someone for a long time, they think from when he was hatched until he was about 5 years old, and for some reason that person had to give him up. Another bird lover took him, but he didn't get along with that person's other birds, so he came back to the pet store. And turns out they would "sell" him to me for $50, all of which would be given to the local Humane Society chapter. So I "bought" him. The lady said his name is Taz, but I decided to call him Tazzie. Also I decided he is a she. We'll find out for sure with more time. She had to take one of our old cages for her first night in our home, meaning that little Bitsie and Scooter had to share a smaller cage that night. But yesterday we got Tazzie her very own new cage, with her own little bird sleepy thing and some toys and some perches and all that stuff. 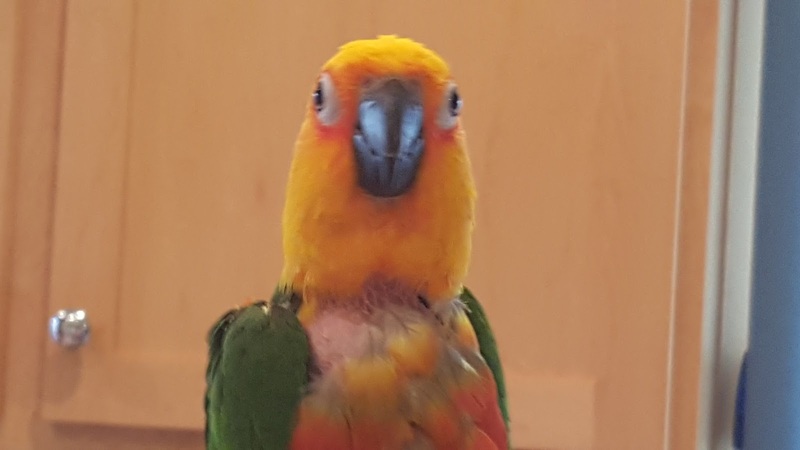 Did I mention she's a Jenday conure? That's a cross between a Nanday conure (like Mada) and a sun conure (like Carly). This breed apparently comes with a lot of really high-pitched and loud screeching, like a sun conure, but that's okay, because when she's sitting on my shoulder, which she loves to do, she doesn't scream, just "talks" to me in a cute little Donald Duck voice. I think she's undernourished because besides being small and skinny for her breed she spends all day eating and drinking. She doesn't seem to be plucking, so we think there's hope that she'll do fine with us. 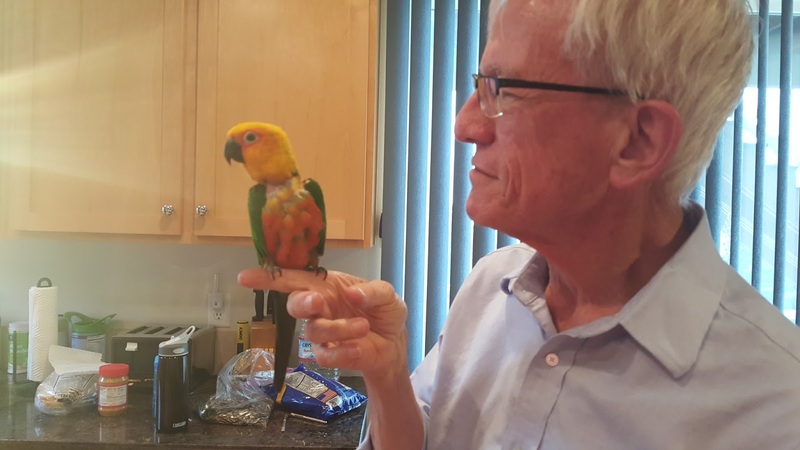 And you can tell she was loved and has been trained, as she steps up when you put your hand up and say "Step up," and only gently nibbles at you when she doesn't feel like stepping up, no big chongs like some other birds we know. And she goes right up to your shoulder and cuddles up to your neck. How much more adorable can you get? Mada and Carly really, really, really don't like her, though. Jealous, of course, and who can blame them. But, again, we think she'll do fine and all the birds will adjust and get along. Maybe not be BFFs, but not lunge at each other whenever they get close. There is a story about a married couple in Minnesota who planned to spend their 20th anniversary at the same hotel in which they spent their wedding celebration. Both of them being busy people, they arranged for him to arrive at the location in Florida on a Thursday and she would arrive on Friday. The time came and he arrived in a very nice room and noted that there was a computer and internet service available. He sat down and prepared an email to his wife. However, in the email address line, he entered one wrong letter. Being unaware of the error, he sent the message intended for his wife. The email, however, ended up delivered to an elderly lady who lived in Texas and had just returned home from the funeral service of her elderly husband of many years. Expecting to hear from distant friends, she decided to check her email. I have arrived here without any difficulty. It is very nice here. You may be surprised that they now have computers here so we can communicate directly with family members and other loved ones. Those here are preparing now for your arrival tomorrow. I hope your trip is as nice as mine. I am looking forward to seeing you soon! PS: It is quite hot here! 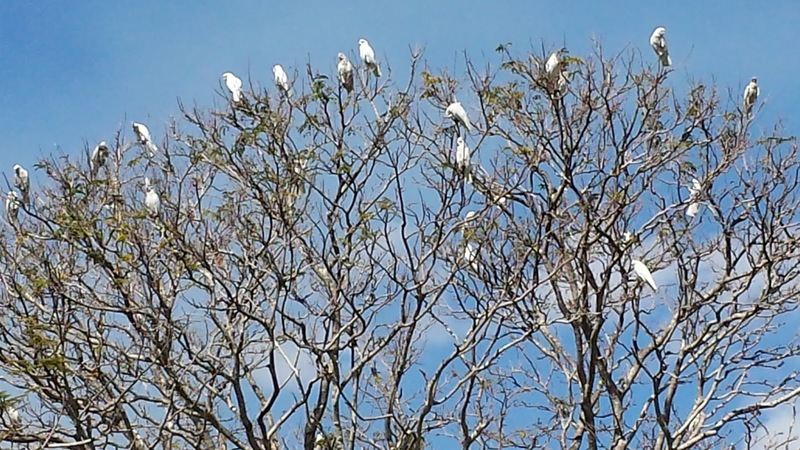 So many beautiful birds in the Northern Territory! 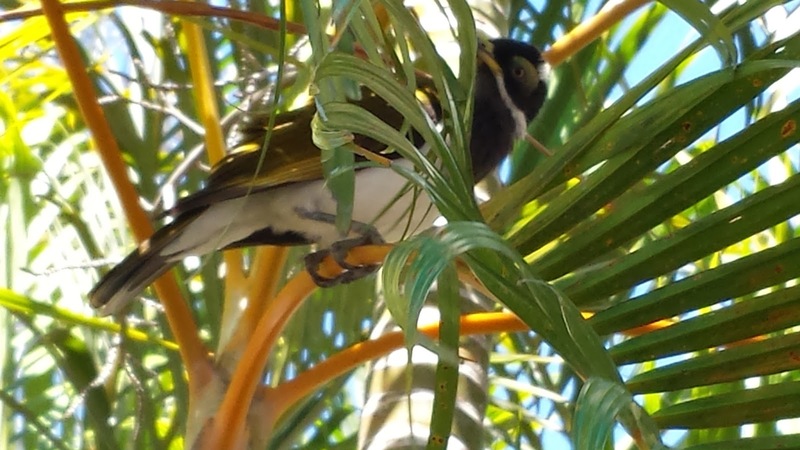 Here's a blue-faced honeyeater. A bunch of these birds accompanied Lisa and the boys and me whenever we ate at the Kakadu Bakery in Jabiru. Driving from Jabiru to South Alligator, we often saw fires along the road. 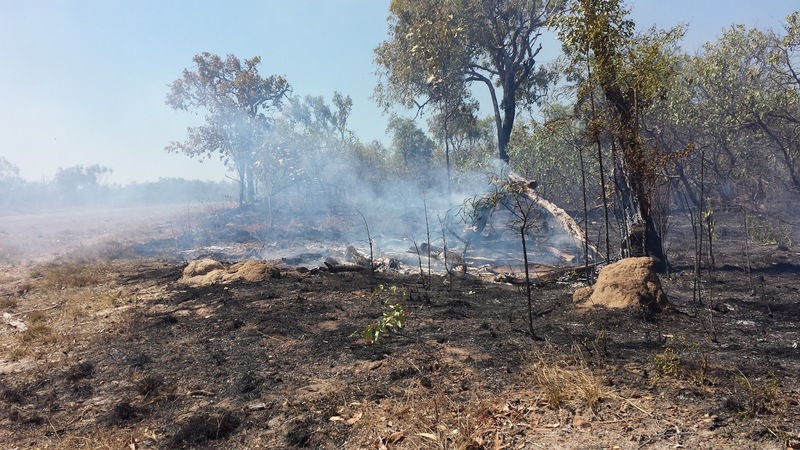 We worried about them, but we learned that they are part of the natural life cycle of the Outback. 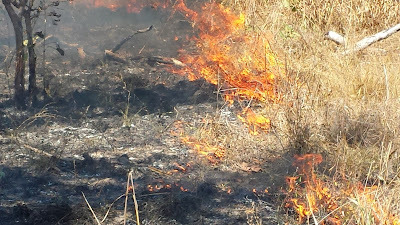 In fact, rangers walk along setting some of these fires. But we worried about this one, spreading fast with no one paying attention to it (except us), so we reported it to some local people. Again, though, they told us not to worry: it would burn out on its own. And when we stopped by the next day, sure enough, it had burned out. Mama wallaby at Katherine Gorge. I know she's a mama because look at that swollen pouch. 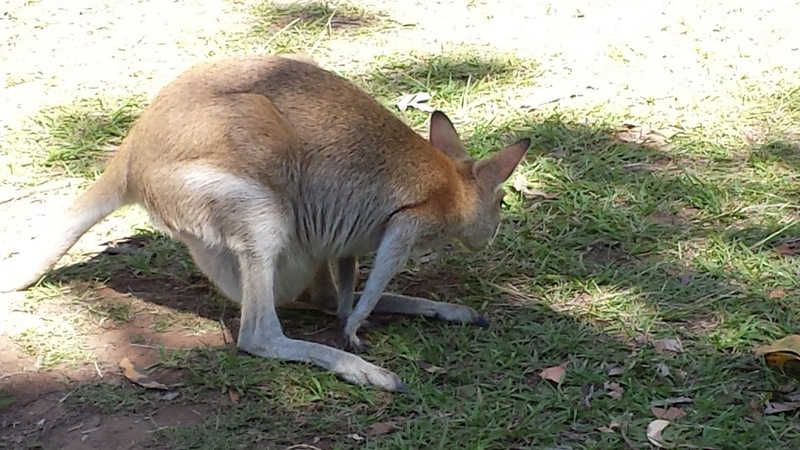 We never got to see the baby (the "joey,") though. The mom got tired of all us tourists watching her and hopped away. 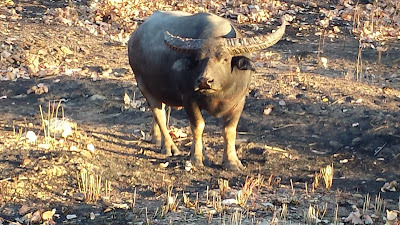 A water buffalo, seen from our car, on the road between Jabiru and South Alligator. We were glad to be in the car! The Jatbula hikers are told to stay away from them, and if the animal approaches, to climb the nearest tree. Ha! I note that most of the trees we saw along there are (1) not near and (2) not tall or big, i.e., not really going to provide any protection from a huge angry charging animal. 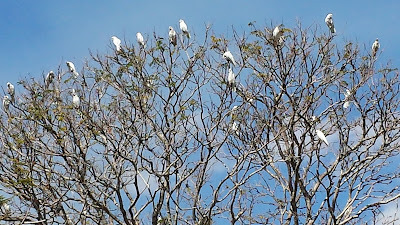 A flock of corellas spent a good part of every day at the Aurora Kakadu Resort where we spent time while "the boys" went on the Jatbula hike. 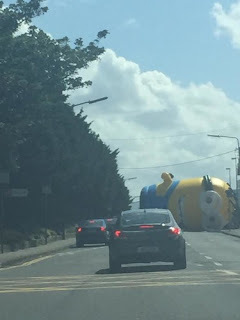 I found this photo online. 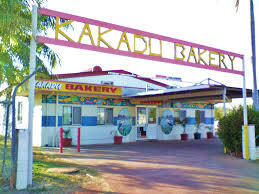 I wish I'd thought to take some photos of the Kakadu Bakery myself. Definitely the best place to eat in Jabiru! We think these are baby kookaburras b/c their heads are even larger with respect to their bodies than with adults. Trying to get some of those beautiful and weird fruits down from a tree. Eventually we gave up with the baseball bat idea and tried the baseball pitching idea. But that didn't work, either. 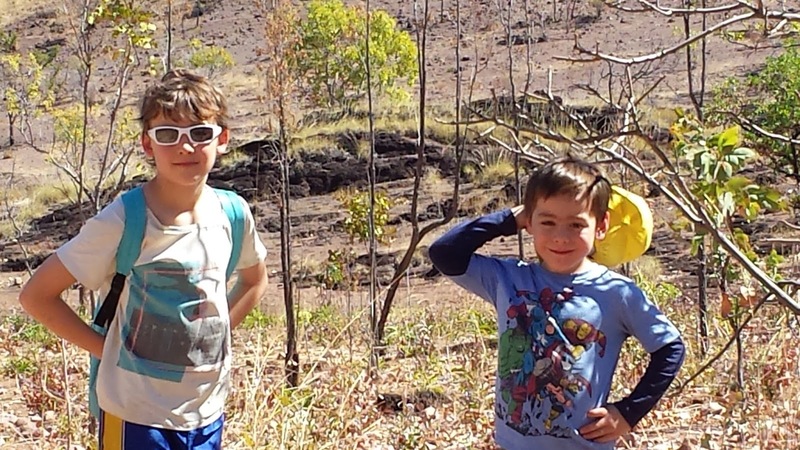 Termite mounds, not just taller than this almost-10-year-old boy, but taller than any adult for miles around. 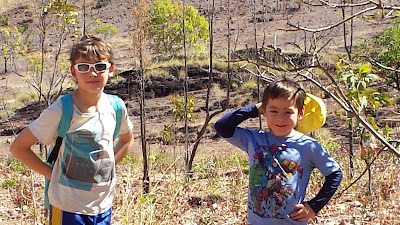 I've got to explain this one: We were walking at the Katherine Gorge area, killing time until we would walk in to pick up "the boys," when an older man warned us: "There's a snake up ahead, right by the trail." Lisa said, "Oh! A snake!" and started running .... toward the area the guy pointed out. And picked up the snake and tried to identify it. It was about a meter long (right, Lisa?) and black. She said even if it were a poisonous snake, its mouth was so small it wouldn't have been able to bite anyone. A lot of people gathered round to watch her handle the snake and listen to her talk about it. Yeah, and I haven't written much, either, about the wonderful people we traveled with while we were in Australia. And I probably still won't. Sorry. But here are some more photos of the scenery and wildlife (in no particular order). Check out this translator from English to Minionese!